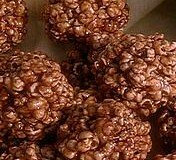 Chocolate popcorn balls are a delicious choice for kids' parties, picnics, or lunch box treats. They are a lot easier to make than you imagine, too. Consider the great fun you can have in the kitchen preparing a batch of these yummy delights with your kids. If you want to make them as party favors, you can pick up clear or decorative cello party favor bags at Candyland Crafts for next to nothing. Just slip a popcorn ball inside and secure it with a ribbon or a twist tie. How easy is that? The kids will all think you are the best! Prepare popcorn and set aside in a large bowl sprayed with cooking oil. Combine sugar, corn syrup, butter, cocoa, and salt in a saucepan and cook over medium heat until boiling. Pour mixture over popcorn and stir well to coat thoroughly. Form into 3 inch balls and allow to cool. Alternately: You can heat mixture in a large pot and add the prepared popcorn to the pot, heating and stirring for a couple of minutes. Sometimes this method makes it easier to coat popcorn thoroughly. Caution: Don't burn your fingers! :) Seriously, this mixture is hot, so be careful. Butter your hands before forming balls. Allow to cool slightly if necessary. Wrap finished popcorn balls in cellophane or plastic wrap. You can also store them in an airtight container until eaten. That won't take long, I'm sure.